Using a horror film to bring your date closer is a classic move in the teenage playbook. Now, a study of Australian birds finds that other animals use the same "scary movie effect" to attract female attention, by hitchhiking mating signals onto the calls of predators. Male splendid fairy-wrens, a sexually promiscuous small bird native to Australia, are known to sing a special song each time they hear the call of one of their predators, the butcherbirds. New research from scientists at the University of Chicago finds that this seemingly dangerous behavior actually serves as a call to potential mates  a flirtation using fear. Published in the journal Behavioral Ecology, the study involved painstaking field research playing sound clips to splendid fairy wrens at a conservation center in Southern Australia. Experiments determined that the "vocal hitchhiking" of male birds is a courtship behavior that uses predator calls to grab the attention of female birds. "We have shown that females do, in fact, become especially attentive after hearing butcherbird calls," said Emma Greig, PhD, first author of the study and currently a postdoctoral researcher at Cornell University. "So, it seems that male fairy-wrens may be singing when they know they will have an attentive audience, and, based on the response of females, this strategy may actually work!" Splendid fairy-wrens are interesting to scientists studying evolution and mating patterns due to their unique social structure, said Stephen Pruett-Jones, PhD, associate professor of ecology and evolution and senior author of the study. While the birds are socially monogamous, forming male-female pairs that last their entire lives, they are sexually promiscuous, mating predominantly with birds outside of their home pair. After years of studying these birds and their close relatives, the superb fairy-wrens, researchers noticed the unique, consistent pairing of butcherbird calls with a unique fairy wren call known as Type II song. "The male begins his Type II call immediately after the butcherbird begins to call, so they're basically right on top of each other," Pruett-Jones said. "It sounds like a duet." But theories varied as to why fairy-wrens would risk exposing their location to a predator by singing. Was it an alarm call to other fairy-wrens in the area? A display of their bravery and physical fitness to attract mates? Or an effective means of capturing the attention of any females in the area? For the study, Greig played different combinations of songs from her iPod to male and female fairy-wrens in their natural habitat: the territorial Type I song, as well as the Type II song with and without the preceding predator call. The experiments found that females were most attentive  as measured by looking in the direction of the call and responding with their own song  when the butcherbird-preceded Type II song was played. The results suggest that males use the predator call as an "alerting signal," Pruett-Jones said, similar to how humans might capture another person's attention by starting their sentence with "Hey!". For the females, the signal may carry information about the location of potential mates in neighboring territories, and potentially may nudge them towards mating, Greig said. "The most exciting possibility is that Type II songs have a sexual function, and that females are more easily stimulated by, or receptive to, displays after being alerted by a predator, such that the male's song is especially attractive," Greig said. 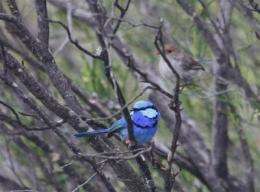 Ongoing research is measuring the physical attributes and genetics of male splendid fairy-wrens and their offspring to see if there is a connection between Type II singing and mating success. But so far, no link has been found between the behavior and physical health, suggesting that the Type II singing is not a self-imposed handicap to make males look more fit and attractive to females. "All males, regardless of age, color, or other measures of individual 'quality,' gave Type II songs with equal frequency, which suggests that singing after a predator vocalizes may not be as costly a behavior as you might imagine," Greig said. "Contrary to what you might expect, singing after a predator call may actually be quite safe: the male fairy-wrens know where the predator is located, and he also knows that the predator isn't actively hunting at that moment, but is instead singing its heart out." Greig is also currently testing how common the "scary movie effect" is beyond the splendid and superb fairy-wrens. While only two other birds, fairy gerygones and white-throated magpie jays, are thought to demonstrate similar predator-elicited display, the researchers believe it may be present and undetected in other species as well. "We suspect it may be more common than previously appreciated. It's definitely rare, but people just haven't followed up in these other species to do these kinds of experiments," Pruett-Jones said. More information: The study, "Danger may enhance communication: predator calls alert females to male displays," was published in the October 12, 2010 issue of Behavioral Ecology. The fairy-wren who cried butcherbird--and got laid. If you lie through your teeth, to the degree where you scare a woman half to death, you might just get some. What a terrible lesson for the kids to learn. Just terrible.